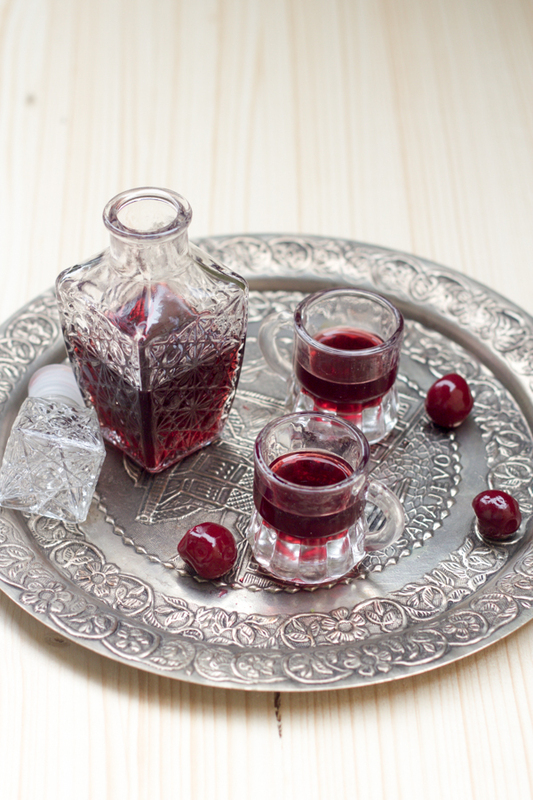 Višnjevača, or homemade sour cherry liqueur is derived from brandy (sherry or vodka) infused with sour cherries and sugar, and left in the sun for 40 days until it becomes a dessert liqueur or aperitif. You know I always write exact recipes for you. I’m a stickler when it comes to precision in cooking. It probably annoys the more experienced cooks out there. I apologize to my more skilled readers. But when I started to cook, I mostly remember hitting my head against the wall every time I came across a term I didn’t know. Especially when it came to food I was unfamiliar with. It was the reason I rarely ventured into the kitchen back then. How exhausting is it to put effort and energy into something and have it not come out? Well with višnjevača, you don’t have to worry. 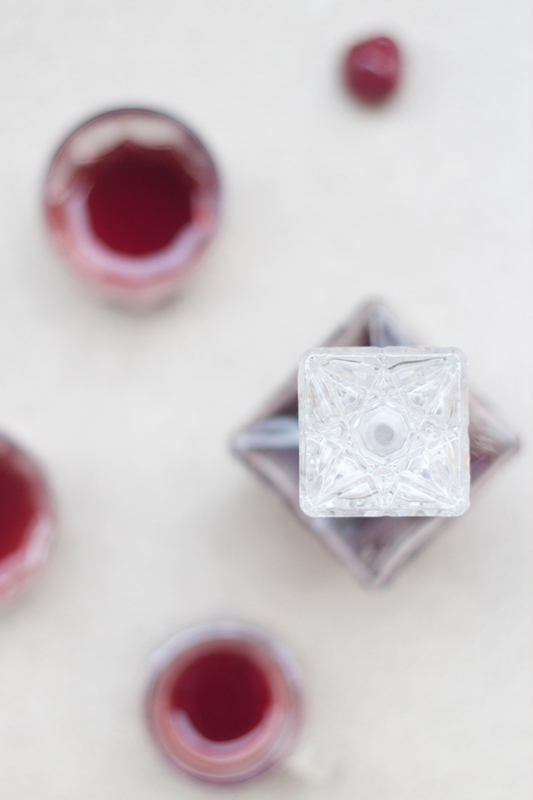 Whatever you do and however you do it as long as you are in the vicinity of the recipe, this sour cherry liqueur will come out well. 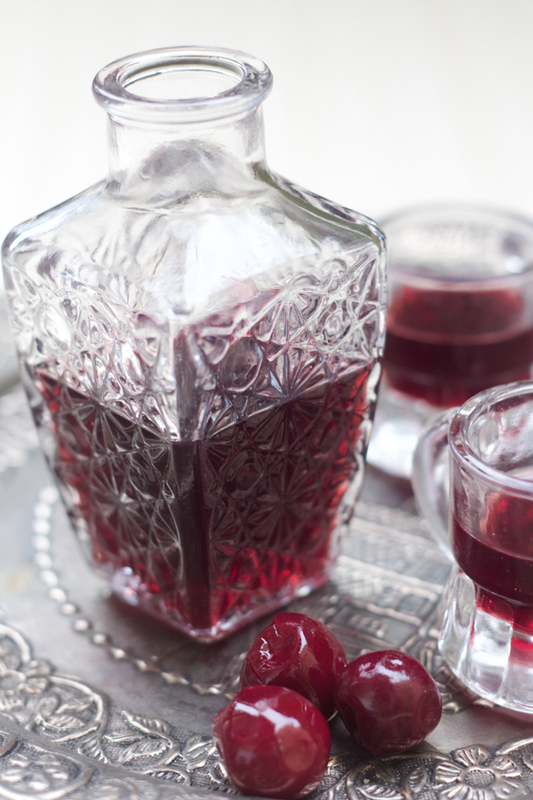 Generally, to make sour cherry liqueur you infuse homemade plum brandy (šljivovica aka slivovitz), or vine brandy (aka loza) with sugar and sour cherries. But unless you make šljivovica or loza at home or have a Balkan store nearby, it’ll be harder to get it in the US. To make it easy for you, I used Sandeman medium dry amontillado sherry. No affiliation here, just what I had in the liquor cabinet. If you’re unsure, go to your liquor store, and ask for something similar to any of the above. Alternatively, a good vodka will do great. Find a higher quality bottle however. The most basic formula is 1:1:0.5. One kilogram (2.2 pounds) of sour cherries to one kilogram of sugar, to .5 (half) liters of brandy. The volume will depend on the size of your jar, and the way you layer everything. As you’ll see in the recipe below, my volume was somewhat different. 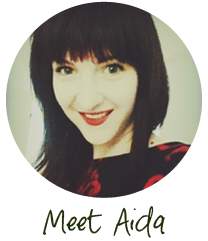 Višnjevača is a perfect recipe for those of you that practice sustainability. Everything is used from the cherry to the stem. Stems are used for teas, while the sour cherries that remain after you strain brandy into glass bottles, are perfect for dessert. After you leave the infused brandy in the sun for 40 days or about six weeks, make sure to stir it every few days. This will allow all the ingredients to mix well, and the brandy to taste the same throughout. This liqueur can be used for months afterwards, although I doubt you’ll be able to resist consuming it quickly. Višnjevača is perfect to serve with dessert or coffee, although in my household it’s used as an aperitif before dinner as well. Once you get hooked, and get into a habit of always having a jar going on your window seal, you’ll never see sour cherry season quite the same way. P.S. If you’re interested in more unusual beverages (not necessarily alcoholic), I highly recommend you try making the juniper berry juice. It’s tastes like a more sour, refreshing version of lemonade. Another favorite is the elderflower cordial. It has a floral taste, but the kind of flower you’d like to drink over and over. And for the daily favorite, there is of course, Bosnian coffee. Layer sour cherries and sugar in the jar. Start with sour cherries, then generously cover with about 4 tbsp of sugar. Repeat until you fill the entire jar. Pour brandy in the filled jar slowly. Pour as much brandy as the jar can take. This process may take a few minutes. (My jar took about 1.5 cups after sugar and sour cherries. Yours may take more.) If space allows, add more sugar on top, and fasten the lid. 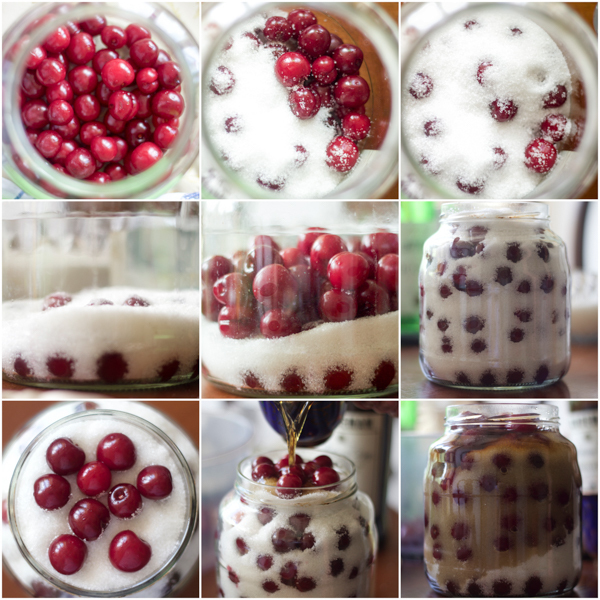 Take the jar outside, and leave in direct sunlight (or a place with a lot of light) for about 40 days or 6 weeks. Every 4-5 days take a spatula with a long handle and mix the sugar and sour cherries well. Undo the lid, take out a few cherries from the top and mix thoroughly. Return sour cherries to the jar and fasten the lid. After 40 days, strain the brandy into glass bottles. Keep remaining sour cherries to use in a dessert. 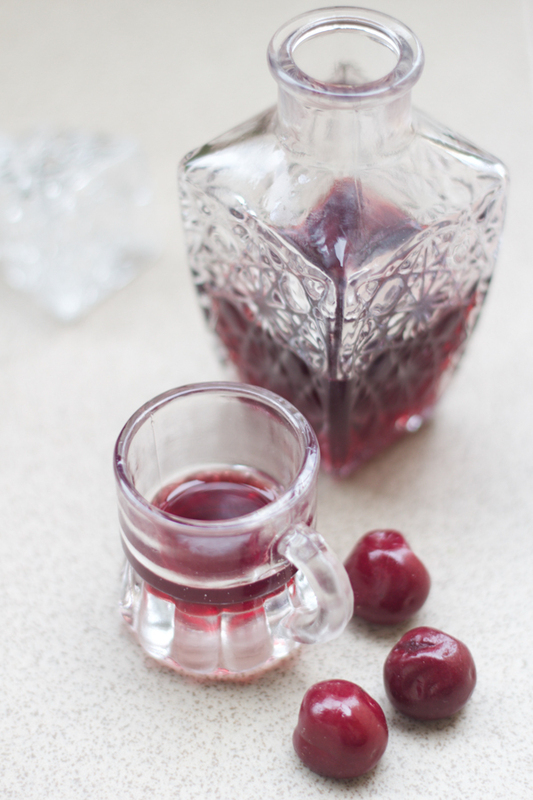 Serve sour cherry brandy (višnjevača) with dessert, with coffee, or as an aperitif. I have frozen cherries that I pitted. Can I use them instead of fresh with the pits in? I am leaving for vacation, and I can’t leave the jar unattended, if it needs to be stirred . . .
Have not made the brandy with frozen sour cherries (they have to be the sour kind), but I see no reason why you shouldn’t try. Maybe do half the volume in a smaller jar to see how it works out. As far as vacation, if you are gone for a couple of weeks or so you, it should be fine. The stirring is supposed to be done occasionally. I picked more beautiful sour cherries and have gone with your recipe of 1:1:0.5 using good quality vodka. I have chosen to take the mix with me, as I will leave it with my son to bottle up close to Christmas. Just of interest, I notice that a lot of other folks posting recipes similar to yours to make fruit liqueurs/brandies advise to keep the mixture out of direct light and in a dark cool place . . . The other thing they say is that they ferment the cherries for a couple of days/weeks in sugar before adding the brandy/vodka . . . my son said there is no way to ruin a batch of alcohol and sugar-laced fruit mixtures because there is no fermentation going on, just infusing fruit with sugar and alcohol, and alcohol with fruity flavours. I cannot comment on other recipes. This is how it’s been done in my family for generations. For example, my mom makes a huge batch each year, and according to many people, hers is the best Visnjevača they’ve tried. Sometimes she infuses it with a little bit of honey in addition to sugar, but otherwise it’s the same recipe she uses. And she keeps it on her balcony that’s sunny for half a day for the entire preparation process. However, whatever recipe you choose to make, I’m sure it’ll come out fantastic. Joy, another thing re: timing. You only need to do the process some 40ish days or 6 weeks. I live in Texas so I am making this with frozen sour cherries. I just wonder about putting it out in the sun for days when it gets in the 90s here. What do you think? It’s supposed to be really hot out as the sun causes the fermentation. It gets sometimes up to 95F here in the summer so you should be totally fine. As for leaving unattended: find yourself a neighborhood alcoholic. Everytime they raise the bottle to drink some the air bubbles they make will perculate and stir the mixture. 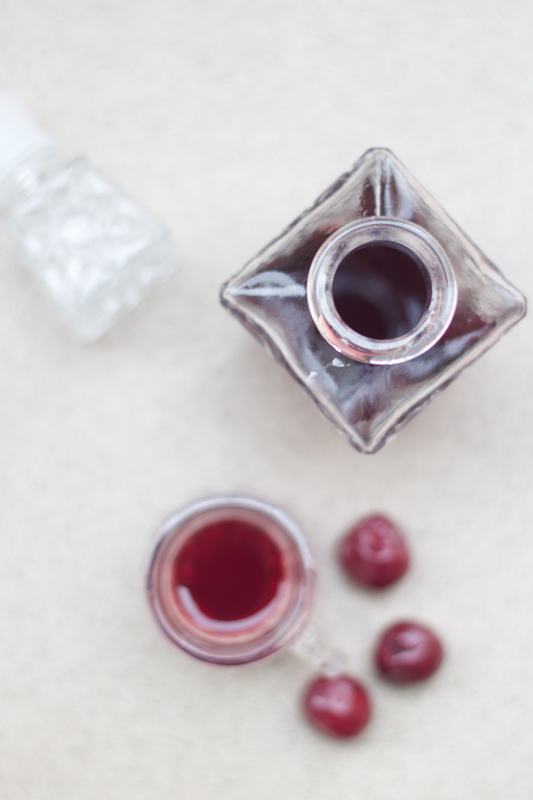 I fermented the cherries in the bottle with sugar and vodka. And I fermented some in the bottle with sugar and NO alcohol. One if the bottles turned into cherry vinegar. I wouldn’t mind some more of that vinigar! I also froze some cherries with pits and some pitted. They have been in my freezor for a couple years. I know cherry pits have arsenic in them. I want to know if the arsenic is an issue? As for arsenic, please note that I am not a nutritionist so this is my opinion only, but I wouldn’t worry about it. Cao, Aida! Super stoked that I came across this. Deda used to make this back home in Belgrade when I used to visit my Baba. I just made four jars worth, and, at 17 days fermenting, they’re looking killer. 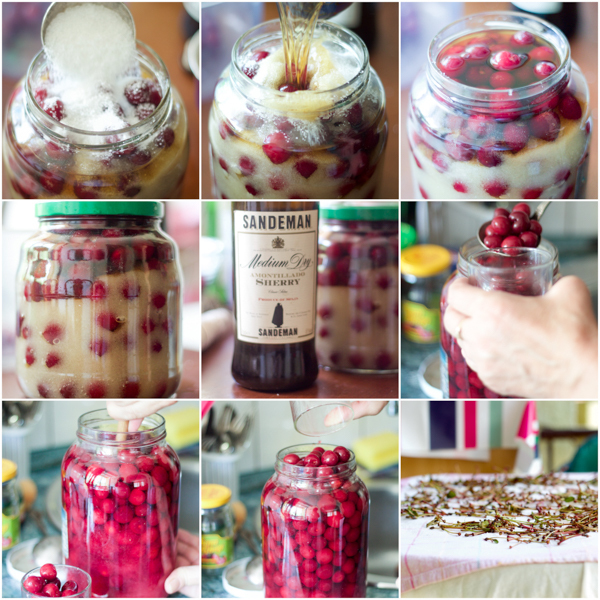 One question for you–how do you store it once you’ve removed the cherries? I imagine it needs to stay in glass. Deda kept it in his China cabinet all year long without it going bad. However, I wanted to verify with you whether you should keep it refrigerated, in a cool, dry place, or really anywhere. Glad you stopped by. Yes, strain it into glass bottles and keep in a cool and dark place. (Liquor cabinet is fine.) It lasts several months, although I promise, you’ll drink it way before then. You can leave some of the cherries inside the drink and eat them as you drink the liqueur. Otherwise, they’re great for cakes, cookies, etc. A note of warning, it takes just a couple of shot glasses to get drunk off this stuff, although it at first doesn’t seem so because it’s so sweet.